Hofstra Law student Landon Dais 3L, a Pro Bono Scholar who works at the Neighborhood Defender Service of Harlem, on April 18, 2015, organized #HarlemServiceDay — a community cleanup and voter registration drive. Many community leaders and organizations, among them Manhattan Borough President Gale Brewer, participated in the day of service. Dais, who has been organizing cleanups for the past five years, assigned dozens of cheerful volunteers to sweep streets, pick up trash and register voters. Dais is an active member of his community and serves as a board member of the Harlem Congregation for Community Improvement. He also ran for New York City Council in 2009 and has managed or consulted for many campaigns. At Hofstra Law, Dais has been committed to pro bono efforts throughout his law school career. He will become an associate at Forchelli, Curto, Deegan, Schwartz, Mineo & Terrana, LLP, but he intends to continue his pro bono work at the Neighborhood Defender Service of Harlem. 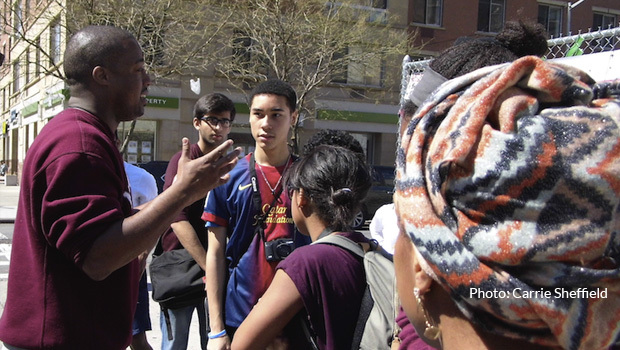 His goal is to make the Harlem community better through community, political and legal engagement. In the long run, Dais would like to improve the political representation in his beloved community, state and country. Dais and Harlem Service Day were featured in Opportunity Lives.